A kilt/lapel pin suspending antiqued pewter charms of flying bats and a Swarovski 'pearl' moon. High quality lead free English pewter. Bats appear in art, jewelry and popular culture around the world. Bats appear in art, jewelry and popular culture around the world. 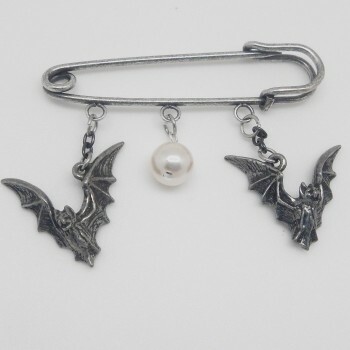 Gothic jewelry and art often includes an influence from and appreciation of bats. The very distinctive and attractive pieces in this series are fun, wearable examples. The pewter will naturally tarnish but may be polished to a brilliant, high luster. 2 inches.